The 40-year old Cabernet Franc vines used for this wine were discovered by chance during a renovation in the 1990’s. The resulting wine escapes the traditional profile of a Cabernet Franc, a product of rustic tannins and a distinctive herbal aroma. The very low yield per plant and the area’s predominantly warm climate make this wine full-bodied and rich with elegant tannins. 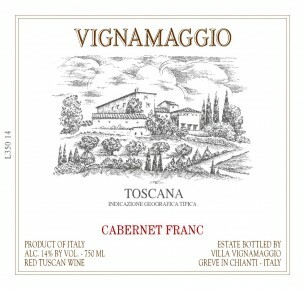 A deep red color, Vignamaggio’s Cabernet Franc has a full aroma, particularly fruity with pleasant notes of bell peppers, typical of the variety. Enjoy with herbed and spiced dishes, roasted pork, beef burgers, roasts or stews, lamb. Grapes are harvested by hand in early October. A careful selection is made in the vineyards and on sorting belts in the cellar. Fermentation and maceration is carried out in stainless steel tanks at controlled temperature for approx 18 days. Once malolactic fermentation is over, the wine is aged in 225lt French barriques for 18-24 months, then 6 months in bottle prior to release.